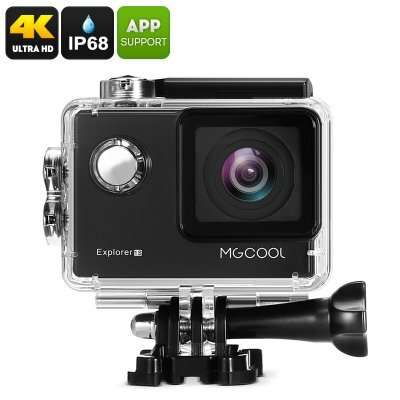 Successfully Added MGCOOL Explorer 1S Action Camera - 4K (3840x2160), Sony Image Sensor, Anti Shake, Wi-Fi, iOS + Android APP to your Shopping Cart. The MGCOOL Explorer 1S Action Camera boasts 4K resolutions thanks to the incredible Novatek 96660 chipset and Sony IMX 078 1/2.3 inch imaging sensor that brings stunning quality at 3840x2160 resolutions. With a 170 degree wide angle lens and large CMOS sensor you'll be able to capture high paced action at 120fps in HD resolutions or 60fps for full HD and even the 4K recording can be done at 24fps so you'll get smooth videos of all those memorable moments. Wi-Fi connectivity and a dedicated smartphone APP for iOS and Android devices let you upload your latest recordings and images online with minimal effort or fuss. It's never been easier to share your adventures for friends and family to marvel at. Coming with a waterproof IP68 protective case you can keep this action camera protected from dirt and water. This lets you record under water videos or take the camera almost anywhere without fear of it getting damaged. A number of different mounts are supplied letting you mount the camera on your bike, strap it on to your helmet or clip it to your body letting you record excellent footage while keeping your hands free. You can play abck your recordings in 320x240 resolutions on the rear screen or use the mini HDMI port to sahre and review your video on a moniotr ot projector. A micro SD card slot offers up to 64GB worth of storage and 1050mAh battery offers up to 80minutes of video recording at 1080P. so you can take feature length videos of your wildest adventures. The MECOOL Explorer 1S action camera comes with a 12 months warranty, brought to you by the leader in electronic devices as well as wholesale sports actions cameras..
APP Name: "Mgcool Explorer 1S"